On 02 February, 2018 (19 Magh, 2074), Nantional Exam Board (NEB) Exam Controller Office, Sanothimi, Bhaktapur has published exam schedule for the Regular and Partial examinees of Grade XI (11) and Grade XII (12). According to the schedule, the Grade XI (11) examinations will be conducted from 30 Baishakh, 2075 (13 May, 2018) to 09 Jestha, 2075 (23 May, 2018) and Grade XII (12) examinations will be held on 14 Baishakh 2075 (27 April, 2018) to 27 Baishakh 2075 (10 May, 2018). The Examination time for Grade XI (11) & Grade XII (12) for the academic year 2074 B.S. will be from 7 am to 10 am. DOWNLOAD and check the Routine in PDF file below. 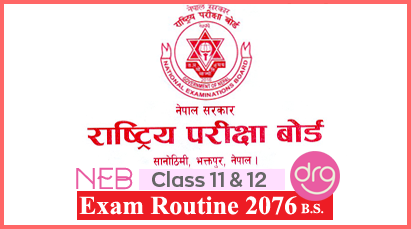 0 Response to "Check Routine Of Grade 11 & Grade 12 | Exam 2075 (2018) | National Examination Board (NEB)"